Well, this is my blog! A fictional blog which could be described as a Flog? A mahoosive thank you for all the positivity out there! I’ve been blogging and flogging since late February 2016 and it’s fair to say that I have been overwhelmed by the lovely comments I have received from bloggers and readers! Gert lush (slightly annoying saying that no one in Devon actually says). *If I can get a chuckle out of you – great, if it’s more of a coffee-infused nose snort of a laugh then I’m chair dancing right here! All I know is that I love this blogging malarkey and get the ‘happy-scary-adrenalins’ every time I press publish! *Full disclaimer: some viewers may find this blog hilariously funny while others may feel it is only slightly amusing. All opinions are your own. Go on, follow me and keep up with all my newly posted posts and shiz! The News according to Turning Up In Devon! Featured on Britmum’s Prose and Poetry Round Up, Woolly hats and welly boots with 45. Village survival, acceptable Autumness This is edited by Dawn at Rhyming with wine and Vicky at vevivos.com A huge thank you to them! A featured blogger at #fridayfrolics with 44. village survival, getting emosh about emojis! Featured on Britmum’s Prose and Poetry Round Up Schools out (2nd August). A big thank you to Dawn at Rhyming with Wine for including me. 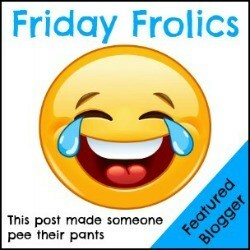 Featured blogger on Friday Frolics with 40. Village survival, a guaranteed muffin top! Big Thanks to Lucy, Claire and Emma for hosting. Featured blogger on Friday Frolics with 38. Village survival, static (caravan) shocks. Big Thanks to Lucy, Claire and Emma for hosting this funny linky. It’s the blogs first Birthday at the end of this month (party like it’s your Birthday) so I’ll be celebrating with a post later in the month. I was super thrilled to be featured blogger on #Friday Frolics with 34. Village survival, the joy* of a new oven! and 35. Village survival. For sale or To(i)Let. A big up to the Frolics crew Emma, Claire and Lucy. Very chuffed to be a featured blogger on Friday Frolics with 23.Village survival, turning up in France! Thank you to Silly Mummy R is for Hoppit and the gang over at #Friday Frolics! Brit Mums Round Up. I was very chuffed to be included in the Brit Mums round up for poetry and prose this August by Maddy at Writing Bubble for my post 18. Village survival, a colourful (parental) visit. It’s the Mumsnet Blogging Awards. Thanks so much if you gave me a nomination for ‘Best Comic Writer’. Here is a comment that I received from Dawn at www.rhymingwithwine.com for 18. Village survival, a colourful (parental) visit. Dawn writes fab poems on many subjects – often about parenting. I always enjoy her poems because she writes brilliantly and her rhyming is absolutely spot on! I loved this comment because it encapsulated so much of what I want to convey in my blog! I received the Pantastic Award (badge) from #Chucklemums Link Up for 15. When we took part in the Village Open Gardens! !